No, Corona is not looking for a new family but is sniffing out a new home. We’re in the city where she spends most of her days indoors and we all know how much Dogo Argentino’s love to run and explore. We want to provide Corona the fenced in yard she so deserves and a house where she can have her own room to play in. While we take this dog out as much as we can, with the new addition to our family she doesn’t get out as often as she’d like. You can help us make her dream of a fenced in yard to run in a reality. Pepsi is hosting a Refresh Everything contest which gives us the opportunity to win $100 000 (you can enter a submission after August 31st, 2010) so we can build a house with straw bales. For more information on this just visit http://pep.si/bAarRz or http://sarahbutland.com/blog/2010/07/15/a-house-of-straw/. Make sure you let us know that you’ve submitted an idea when it opens again and we’ll support you all the way. Introducing Martha Stewart Pets Exclusively to PetSmart! 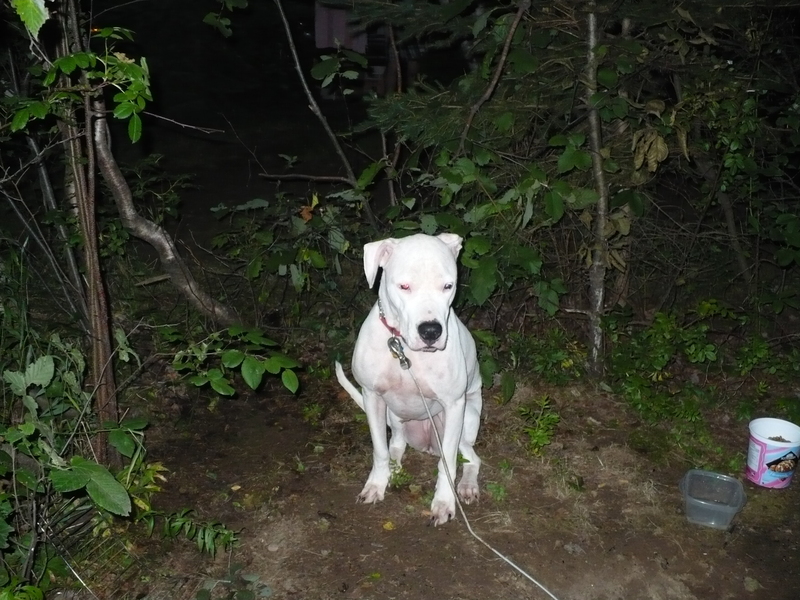 This entry was posted in Corona and tagged August 31st, Com Blog, Corona, Dogo Argentino, Hosting, Love, Martha Stewart, New Addition, New Id, Pep, Pepsi, Pets, PetSmart, Refresh Everything, Straw Bale, Straw Bales, Submission on July 29, 2010 by CoronaTheDogo. Corona loves to go after pieces of wood and will do so until she’s blue from cold if we let her. Balls just don’t hold her attention nearly as much so when we took our frisbee to the beach we didn’t know what to expect. Chalking her disinterest up to being her first time at the beach in a year we kept up the encouraging words until the rain made us stop. After a few more visits and practice runs we’re sure Corona will love playing frisbee almost as much as she loves fetching a stick. This entry was posted in Corona and tagged Balls, Corona, Disinterest, Dog At Beach, Encouraging Words, Frisbee, Frisbee Dog, Frisbee Fun, Fun, Love, Pieces Of Wood, Rain on August 29, 2008 by CoronaTheDogo. Corona alludes to the idea that she’d love to go exploring in the deep, dark woods but this Dogo Argentino hasn’t been brought up brave. Living in the city she doesn’t get much chance to see and explore a forest but the smells were enough to tempt her. Always on a leash this weekend, Corona just didn’t know what to do with herself and had us know it. Trying to keep her entertained and comfortable was enough to have us need another vacation but this would be it for a while. Now home in the scariness of her bed Corona is much more relaxed. 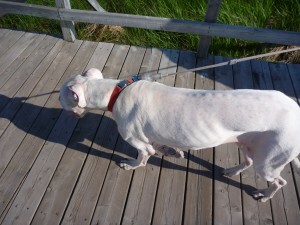 This entry was posted in Corona and tagged Attempt, Corona, Dogo Argentino, Hunting, Living In The City, Lost, Love on August 22, 2008 by CoronaTheDogo.